Ashley Swann with her record setting Kokanee Salmon from Lake Nantahala. 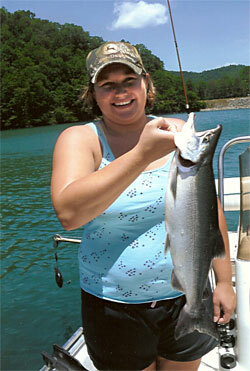 Angler enthusiasts enjoy a wide variety of fishing near Nantahala lake. While the Topton, NC and Nantahala River areas are best known for their trout fishing opportunities, a day with your fishing pole at the lack will lend you more than a wide variety of catches. Lake Nantahala, however, holds a special kind of fish that no other lake in North Carolina has: The Kokanee Salmon. What is the Kokanee Salmon? The Kokanee Salmon is a variety of sockeye salmon that lives in landlocked, freshwater bodies around the United States. The fish, named for it’s title of “silver trout” in the Okanagan language, was stocked in the lake as a forage fish for other predators in the lake by the NC Wildlife Resource Commission in the 1960’s. Lake Nantahala is the only lake in North Carolina to stock the fish, though the fish can also be found in lakes in the Western US, namely in Alaska, Washington, Oregon, and several other states. Want to set a record? According to the North Carolina Wildlife Resources Commission, the current record for the largest Kokanee Salmon from Lake Nantahala belongs to Ashley Swann and was set in June of 2009. The record-breaking catch weighed in at 3 lbs and 9 oz. What other fish are available in Lake Nantahala? Even if you don’t land a Kokanee Salmon, chances are you’ll catch an impressive variety and number of fish during a day at Nantahala Lake. In addition to the rare Kokanee and the famous Trout, you can find Bass, Sunfish, Crappie, and Walleye in the lake, providing you a wonderful variety of freshwater fish to target for your day on the water. Ready to head out on the lake for a day of angling? First, make sure that all of your licenses and gear are ready to go and that the fish you’re targeting are in season. If you’re a lake area resident, such as a homeowner in the Reflections on Lake Nantahala Community, you’ll even get to save on your license as they are cheaper and last longer for area residents. If you want a little help finding the sweet spots on the water, consider using a fishing guide from the Nantahala area. Photo via NC Wildlife Resource Commission.